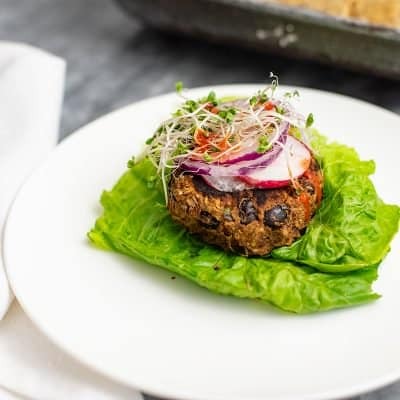 This 5 ingredient vegan black bean burger recipe is going to become your go-to dinner on busy weeknights! 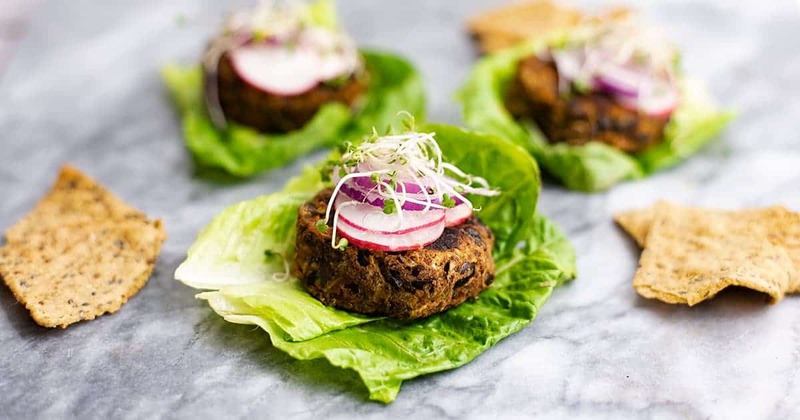 These vegan black bean burgers are ready in just 15 minutes from start to finish and could not be easier to make! The are vegan, gluten free, low fat and super simple! 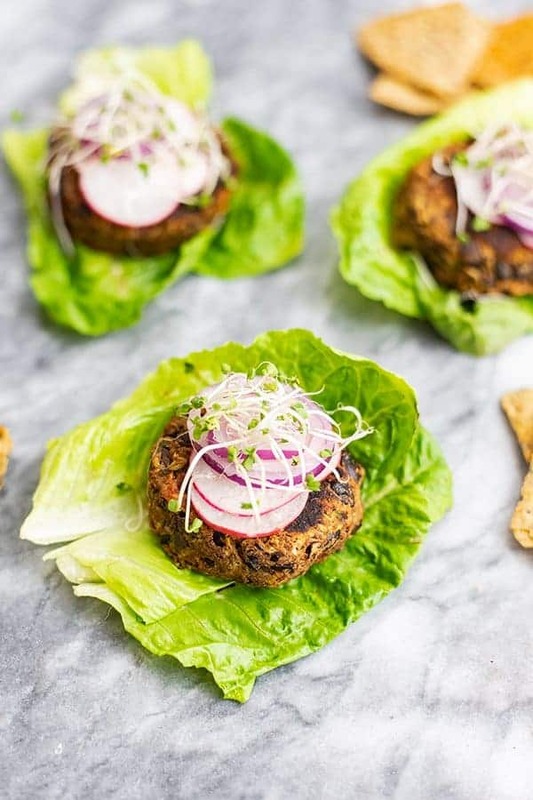 This recipe for 5 ingredient vegan black bean burgers is sure to become a family favorite. These burgers stay together when you flip them (big win), are packed with flavor and even have a full serving of veggies hidden in them! 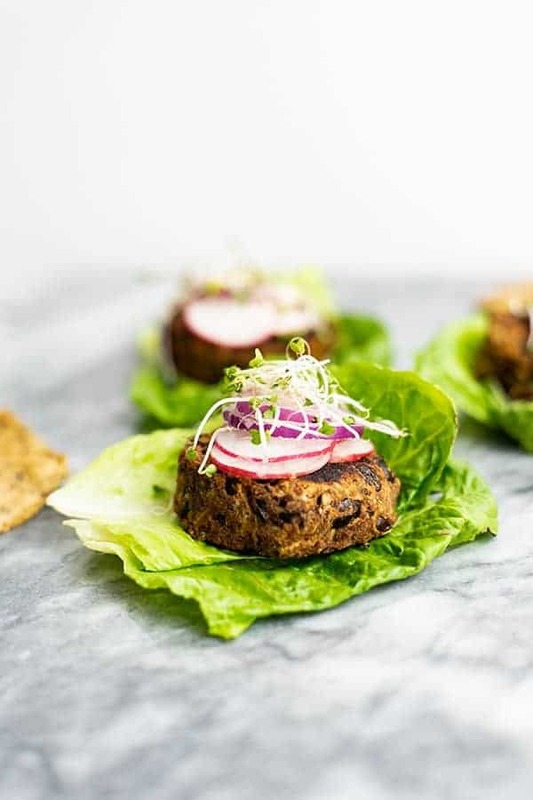 Yup not only are these black bean burgers egg free and grain free, but they are also packed with zucchini! I’m sure if you are anything like me, you have had your fair share of pretty boring veggie burgers. Sometimes they can taste really good but be full of some super sketchy ingredients.Which is why I wanted to make a super simple recipe that you could put together in about the same amount of time it would take you to pull one out of the fridge or freezer. Oh and oil to spray on your pan to make sure these don’t stick but I’m not counting that as an ingredient. 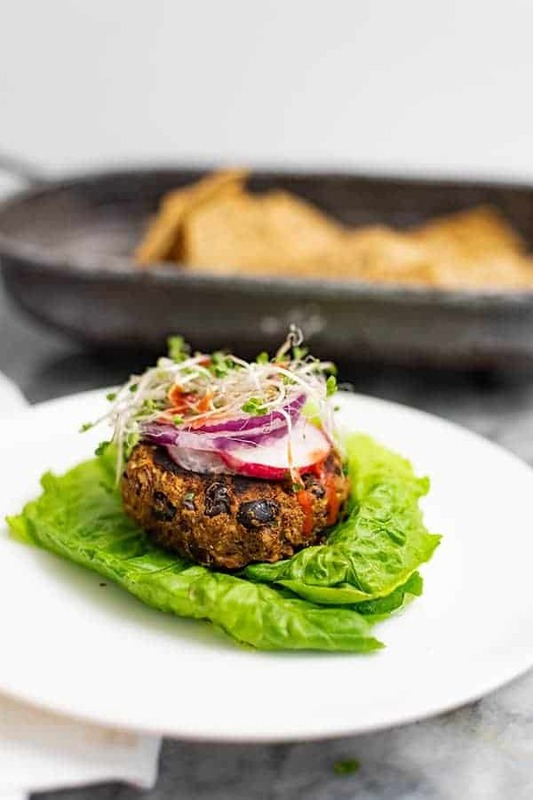 Yup this is the CLEANEST vegan black bean burger recipe you are going to find. And you don’t have to be a gourmet chef to put it together! Mash at least half the black beans with the ground flax and let it sit together while you are shredding the zucchini. Use your food processor shredding tool to quickly shred up the zucchini. You could also use a hand grater, but this will add time to the recipe! Be sure to squeeze out ALL THE EXTRA liquid from the zucchini before you add it to the black bean mixture. You can easily do this with your hands over the sink, no need to get a special towel. Just take about half the shredded zucchini and squeeze it between your hands, pressing until you can’t get more liquid. Add this to the black beans and repeat with the second half of the zucchini. Get your skillet HOT before you add the oil and black bean burger patties. This ensures that your burgers don’t stick! Also don’t be afraid to really spray your skillet so these don’t stick! How to avoid digestive discomfort from eating beans? I have a confession to make, I haven’t made my own vegan burgers in so long. I actually gave up eating lentils, beans and quinoa after I realized that eating these foods was causing me a ton of discomfort and pain. This was a huge shift for me since I grew up eating vegetarian and beans, lentils and quinoa were my usual go-to sources for protein (along with eggs) most days. Use digestive enzymes (affiliate) with these foods. These are the steps I take to ensure I am able to digest beans easier! After 1 year of removing these foods, I can happily say that I can eat all the black beans, chickpeas and quinoa without any tummy trouble! So if you have experienced the same discomfort, there is still hope! I’ve mentioned this before but make sure to buy organic beans (both canned and dried), as I’ve heard that the pesticides sprayed on these crops can contribute to tummy troubles! Also, be sure to soak your beans in apple cider vinegar (if you are soaking and cooking them yourself) or drain the beans from the can and let them soak in fresh water for at least 5 minutes to make them easier to digest! 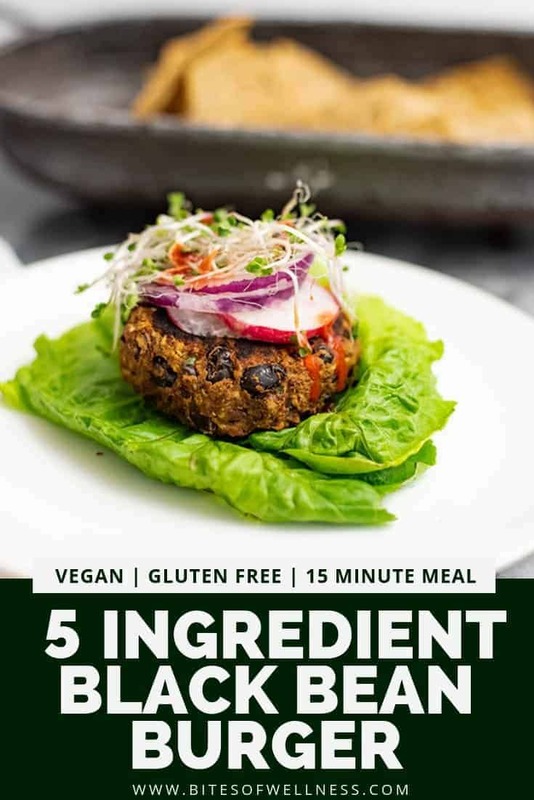 Of course being able to tolerate beans again made me jump for joy, because there is nothing better than a homemade vegan burger and this 5 ingredient vegan black bean burger recipe was the first thing I made and it was so good I couldn’t wait to share it with you! Black beans and ground flax are both a great source of soluble fiber, meaning they will help fill you up and help you stay regular! 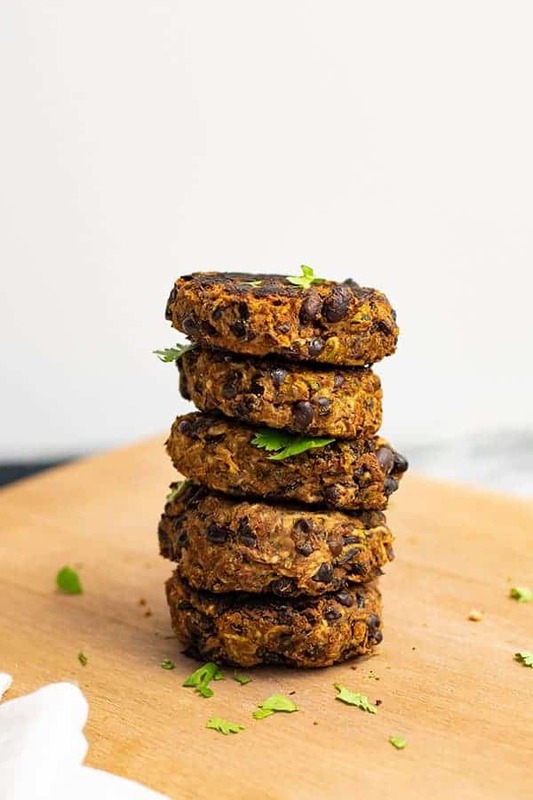 Black beans are also a great source of vegan protein and complex carbohydrates, meaning they help provide a slow steady release of energy for your body and brain! 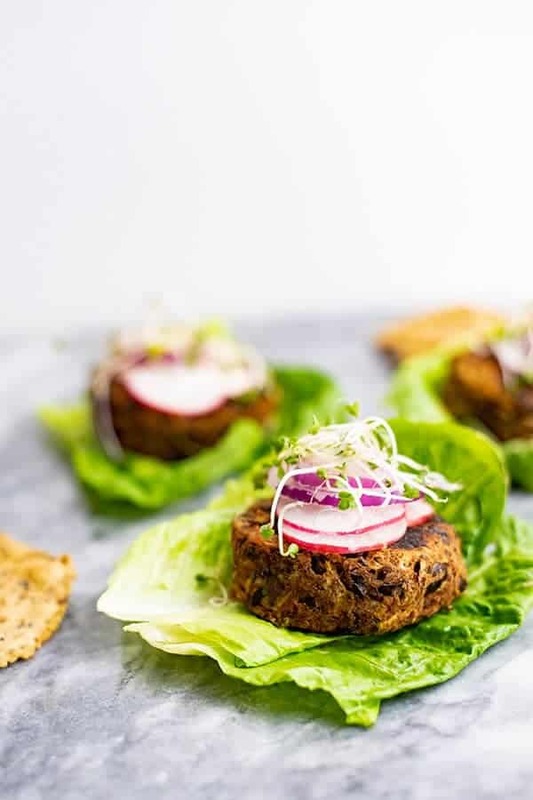 The combination of complex carbohydrates, filling fiber and lean muscle supporting protein makes these veggie burgers a great option if you are trying to lose weight and/or feel full after your meals. Black beans are also a great source of key vitamins and minerals, including magnesium, iron, folate, phosphorus and B vitamins! Black beans have gotten a bad rap, especially in the paleo and ancestral diet community because they have a compound called lectins associated with them. Lectins are thought of as the beans natural defense mechanism, as it is thought that they bond to key nutrients in the food, thus not allowing to absorb the minerals in the food you are eating along with the beans. 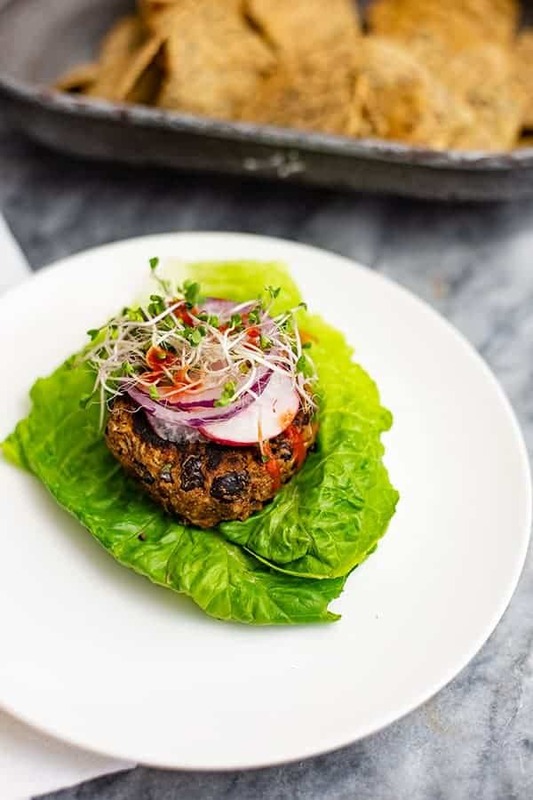 This is the easiest and best 5 ingredient vegan black bean burger recipe! Simple to make and perfect for a quick and easy weeknight meal (ready in 15 minutes or less). This recipe is vegan and gluten free and super filling! Rinse and drain black beans. Add ground flax seed and mash half the black beans with a fork, making sure to incorporate the ground flax seed into the mash. Let the ground flax and mashed beans sit together while you grate the zucchini. You can use your food processor attachment or grate by hand. Once the zucchini has been grated, you will have to wring out the excess water. You can use your hands or a clean cheese cloth to do this. Add the zucchini to the black bean and ground flax mixture. Add the spices and stir well, to fully incorporate the zucchini and spices. Form the burgers into 6 equal size patties, about the size of your palm cupped. Preheat a cast iron skillet (affiliate link) over medium heat. Spray with non-stick or add about 1 tsp. avocado oil and brush it out to cover the surface. Add the vegan black bean burgers and cook for 6 minutes over medium heat. Flip and cook 4 additional minutes.